The more I explore the ins and outs of choosing luggage, the more I realize the most important distinction to make when you’re trying to pick a set is the major difference between hardside and softside luggage. The distinction between the two is entirely self-explanatory, but that doesn’t mean there isn’t a whole boatload of nuances to pay attention to during your search. Softside luggage in general, refers to canvas-like or Nylon baggage that flexes under pressure. 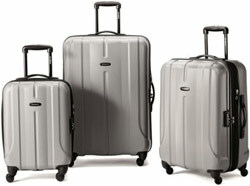 The majority of luggage is softside, and it doesn’t have the firm outside structure that hardside cases do. That being said, many people prefer the softside option over hardside cases for many different reasons. Softside luggage is more flexible than hardside. By nature, canvas and similar materials are flexible. This means it’s much simpler for these pieces to fit into tight spaces or collapse down some to allow for extra space for other bags. 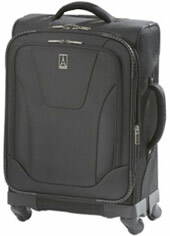 Additionally, softside luggage is more likely to be expandable, like the Samsonite Lift Spinner. If you’re traveling and you know you’re going to bring back more than you left with, an expandable case can be the difference between using the same bag and having to buy a second one. Many softside cases however, are not entirely flexible and, actually preserve the softside look despite the fact they have reinforced shells that sit just beneath the exterior fabric. 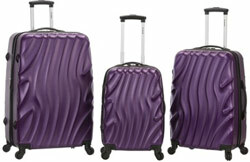 The Travelpro Maxlite Spinner I reviewed here has this feature, so the exterior is able to stand up to some substantial use despite the “soft” sides. Another perk of softer cases is the material tends to be less likely to irreparably mark. If something gets on them, it can be wiped off with a wet towel most of the time. Plus, dings and scrapes don’t usually stick or make a difference to softcases. This is not the “case” with a lot of hardside luggage unless it’s been made to have a texture that doesn’t show blemishes. Hardside cases on the other hand, actually come in two different styles: hardsides and hard cases. Hardside cases may be a more obvious option than canvas-like bags to protect contents, but there is still a fair possibility a good wallop could damage the things inside. The Rockland Melbourne 3-piece set is a great example of structured hardsides with the versatility of different external textures. Hard cases are inflexible, solid options that don’t bend under pressure. The Samsonite Luggage Fiero is one such rugged beast! They’re usually made of polycarbonate, and they don’t offer a whole lot of external frills as far as expansion or pockets go. The shell will protect the contents of the case, so packing breakables is less of a worry. Inflexibility offered by hard cases can prove to be an issue when you need a little bit more out of your bag. For instance, canvas bags often offer at least one exterior pocket to put your belongings into. If you’re racing though the airport to make a flight, a small outside pocket to put things like your wallet, boarding pass and phone charger in is helpful so you don’t have to stop and open the whole case. Most hard cases don’t offer anything like that, and the only way to get things in and out is to stop and open the whole case. Additionally, the majority of hard cases don’t have options for flexibility of size either. Canvas bags can often be expanded a substantial amount by unzipping extra space. Most hardside cases except for one or two sets like the Delsey Helium Expandable Spinner, don’t have the option to unzip extra space that can be used if you have more coming back than you did going. 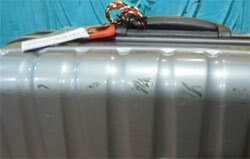 A common complaint about some hardside or hard case luggage is they show wear and tear pretty quickly. If you bang your softside canvas luggage into the wall, it will flex some and go back to the same structure. If you do the same with hardside luggage, the mark may stay on the exterior of the case and show as a battle wound for the life of the luggage. Another issue with hardside cases that still retain some flexibility is they can dent. What may be an unapparent blemish on a softcase, could turn out to be a dent on a hard case that can be difficult to get out (if it comes out at all). Luggage options have come so far in the last twenty or so years that despite the exterior of the case you purchase, it’s likely to be pretty sturdy if you do your research first. Less expensive bags have a tendency to fall apart or tear on the outside, but more reputable brands that focus on quality should hold together whether you go with hardsides or softcases. That being said, they definitely serve different purposes, and if you’re going to be checking anything precious into the baggage area of a plane, you should make sure you have some sturdy hardside options. Otherwise, make sure to read through the possible cosmetic and functional issues of hardside luggage as well as the safety limitations of softside cases, but then you’ve just done that!